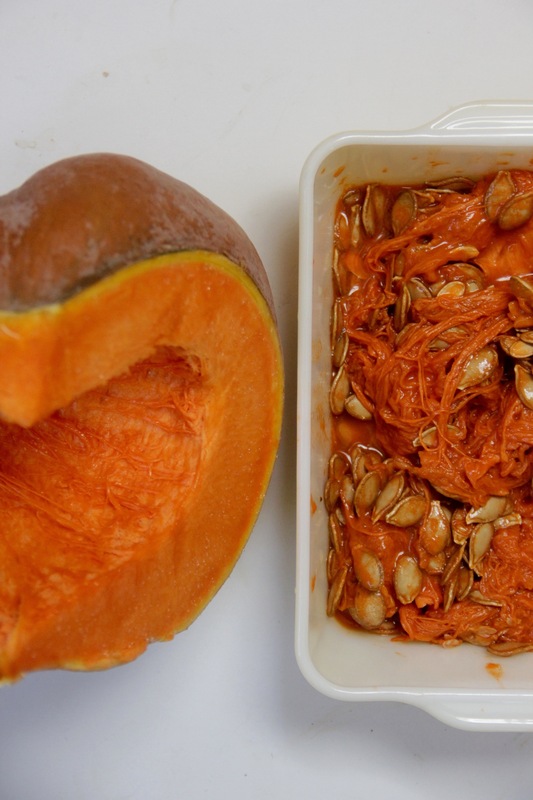 Ever wondered how to cook a pumpkin? Fall is the season for pumpkin everything. Pumpkin spice lattes, pumpkin bagels, pumpkin candles, pumpkin pancakes, pumpkin pies- need I go on? Realistically, we all know it’s never ending. 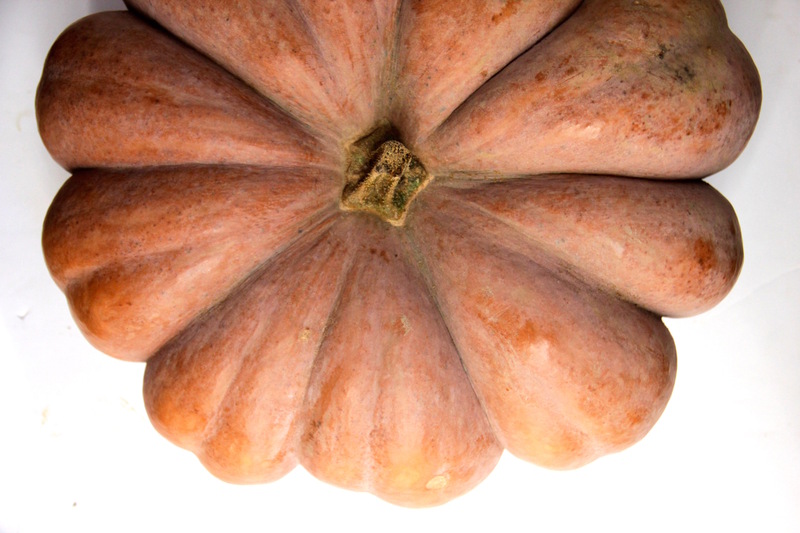 But here’s the thing- for being so pumpkin-obsessed, very few people actually deal with whole pumpkins. They can vary in size of course- from small-sized edible pumpkins to massive whoppers like this 25lb fairytale pumpkin (for more information on identifying different types of pumpkins & what do with them- check out my post here). So understandably, such an endeavor can be intimidating. After all, how often does one cook more than 10lbs of anything let alone, cook a pumpkin? Other Goodies: Not only do you get pumpkin puree but you can also enjoy other goodies like pumpkin seeds and pumpkin water (And don’t worry if you’ve never heard of pumpkin water- I kind of made up the term but I’ll get back into it later). While you can get them at the store, more likely than not it’ll probably be locally grown, so you get the additional benefit of buying local! Realistically, the process takes a decent amount of time and so it makes for a good afternoon event (or something for a rainy day, or a chilly day), but it’s mostly a lot of waiting around and checking on it occasionally. I typically save such an event for a Saturday or Sunday. The process really isn’t that complicated or labor intensive- it just takes time. So let’s go ahead and look through these delicious process photos and then discuss how you actually do it! Rinse: So first off, with whatever edible cooking pumpkin you have, always rinse off the outside and try to remove any dirt or grit from it. Cut: Then, with a large knife, cut the pumpkin into manageable segments. 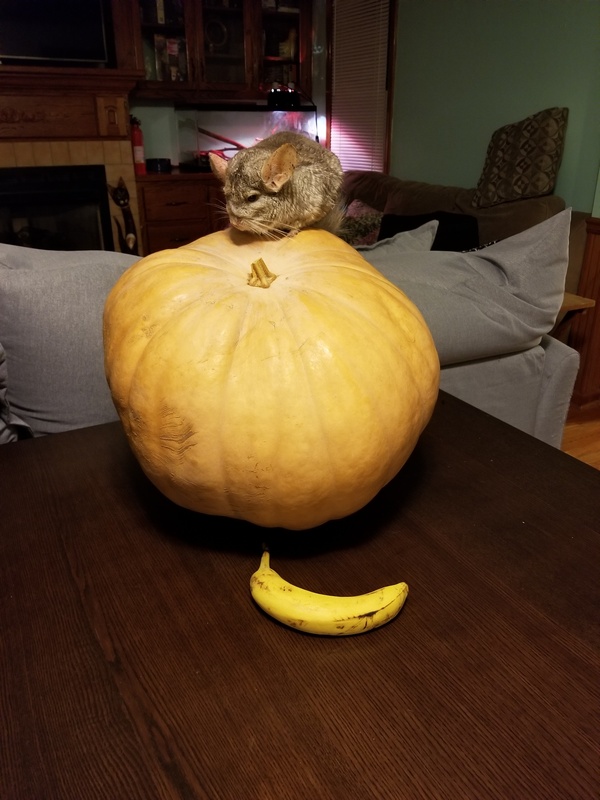 Depending on the size, I typically only half the pumpkin or cut it into quarters, but seeing how large this one was, cutting it into fifths made more sense. Bake It: Put some olive oil on your hands and carefully massage some oil all over each slice. It doesn’t need to be a lot- just enough to lightly coat it. Then, carefully place the cut pieces onto baking sheets and place in an oven preheated to 400°F. Depending on the size of your pumpkin you may only need one sheet or you may need two. Because cooking times vary substantially based on the pumpkin size but simply check every 20 minutes- you may also want to rotate the baking sheets from time to time. When you think it might be getting ready, use a fork or a knife to see how soft the pumpkin is. When it easily slides in, it’s time to remove the pumpkin! 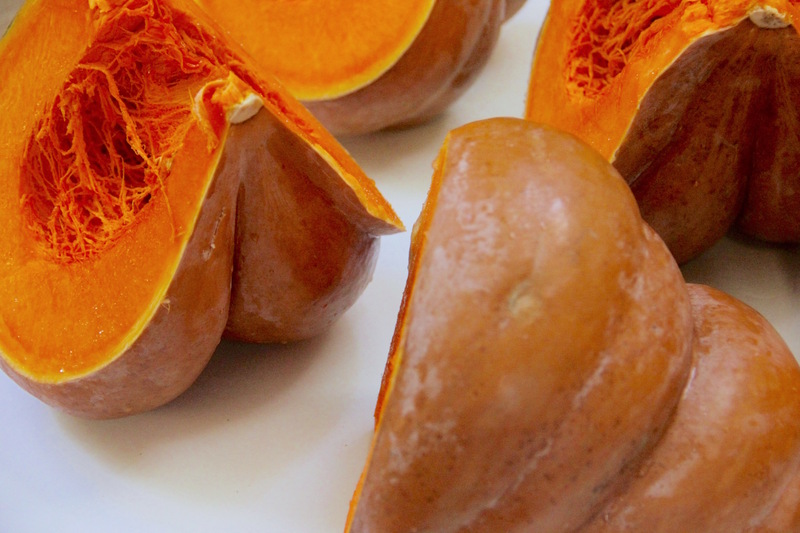 Scoop It Out: Wait for the pumpkin to cool to a comfortable temperature before scooping out the inner flesh. 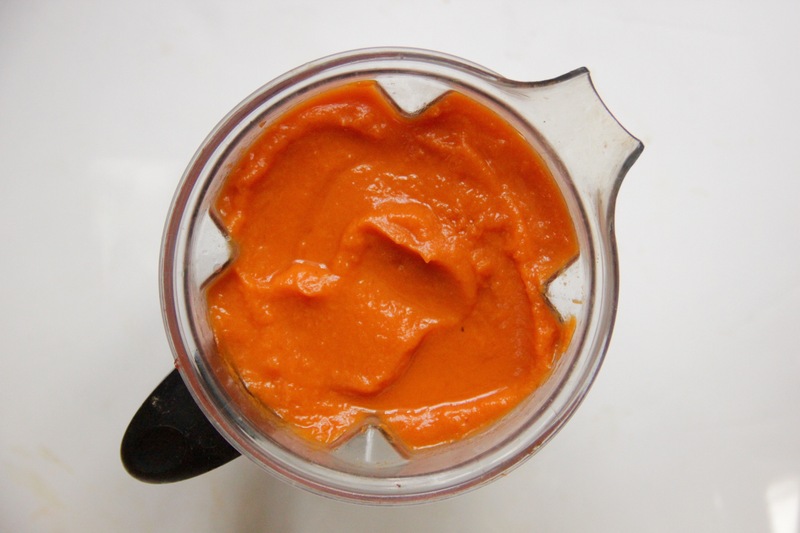 Once it’s cool enough, scoop out the inner flesh and place it into the blender to blend (this may take multiple times). Strain It: Lay your cheese cloth across the strainer and place the strainer over a large bowl (the cheesecloth isn’t entirely necessary, but it certainly helps to keep as much flesh contained without letting it run out with the liquid). 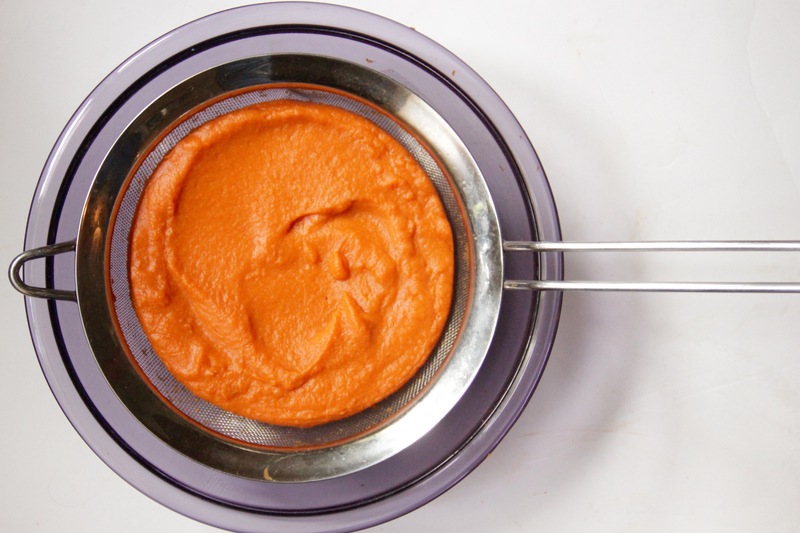 Carefully pour the blended pumpkin flesh into the strainer and allow it to drain for about 10-15 minutes. The liquid that strains out is what I call the “pumpkin water“. You can either throw this out, or save it to use as soup liquid, smoothie liquid or anything else you can think of! Bag It Up: One tip I learned a few years back was to scoop out exactly two cups per bag. Canned pumpkin typically has about 2 cups and this way, you only pull out exactly what you need! So using labeled sandwich bags (I mark the date on each), scoop 2 cups of pumpkin puree into each one (this is where I use my large-mouthed funnel to try and keep things clean), seal it and place each one flat into the freezer and freeze until you’re ready to use them! See, that wasn’t so hard, right? 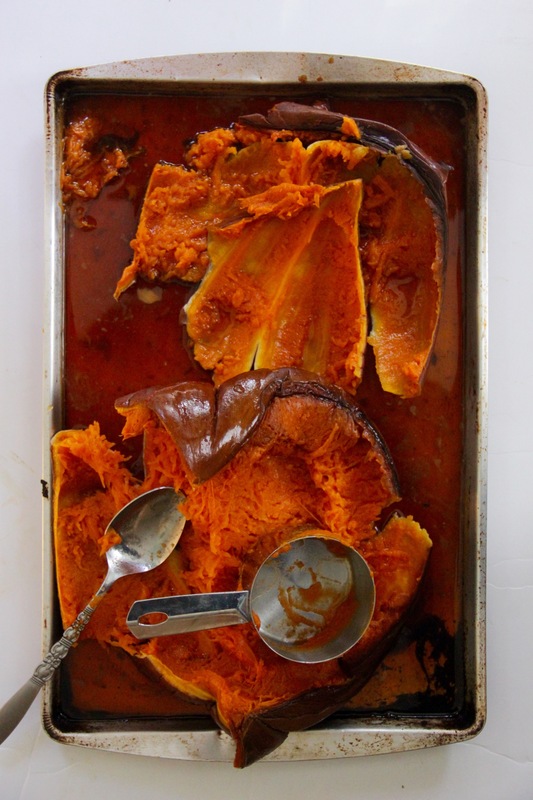 I’ve always bought that pumpkin-in-a-can stuff whenever baking or making a recipe and wouldn’t know the FIRST thing to do with an actual pumpkin – good tips, thanks! 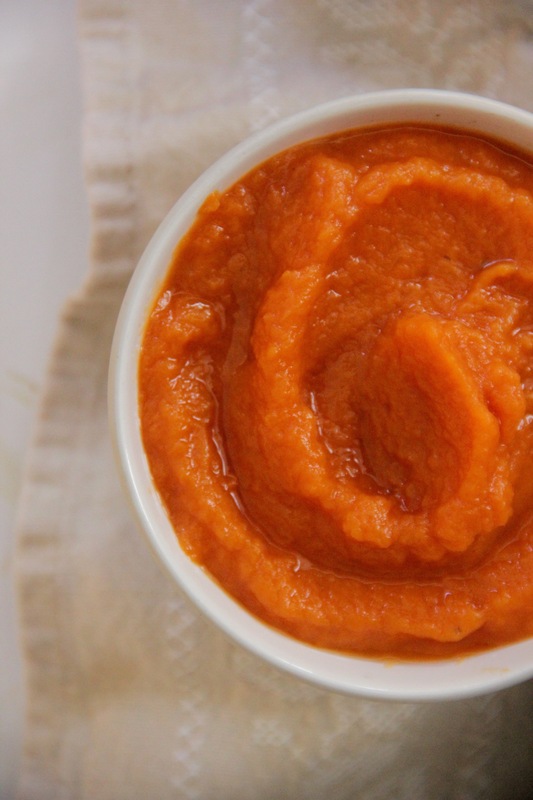 I can’t believe you got 14 cups of puree out of a pumpkin! Holy moly! I did something similar last year for pumpkin pie but I used a big Kabocha squash instead of a whole big pumpkin. 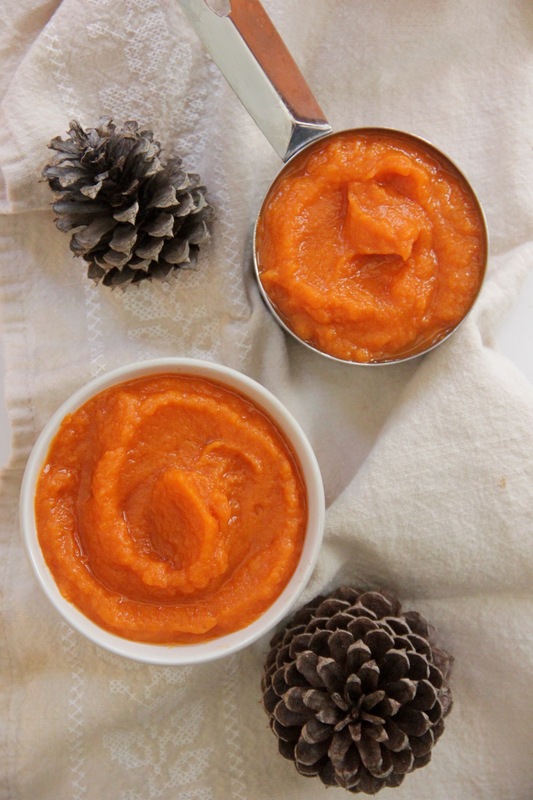 Canned pumpkin is convenient but homemade pumpkin puree is so much better! Thanks for the guide! 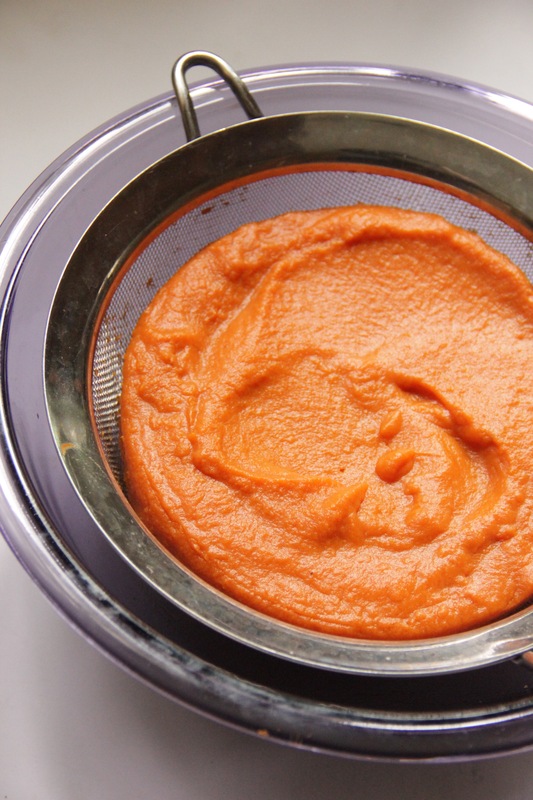 I processed my 42lb pumpkin into 50 cups of puree last night using this! Reading comments like this makes me so happy- thank you for sharing! It sounds like you had quite a whopper of a pumpkin there. 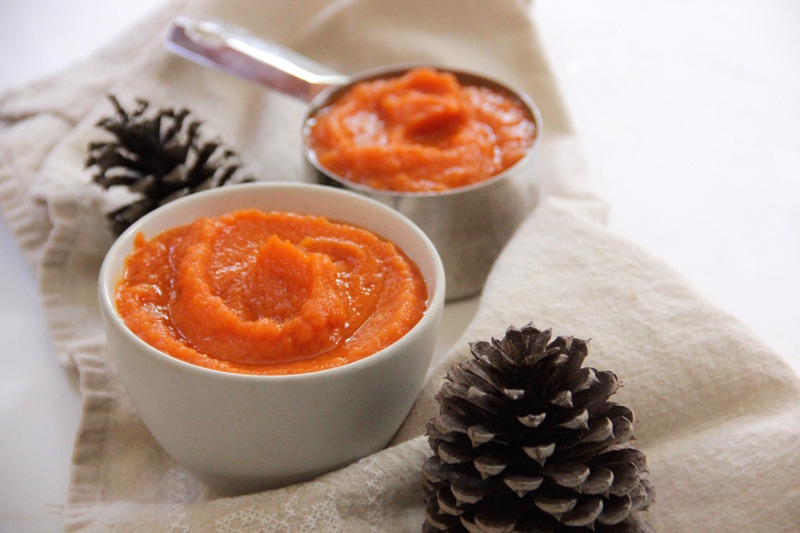 I’d imagine you’re all set for the year with puree now and I hope you have enough storage space for it all!